The following is a guest post by Maria Nieto, author of Breaking the Silence. If you would like to write a guest post on my blog, please send me an e-mail at contact@cecilesune.com. 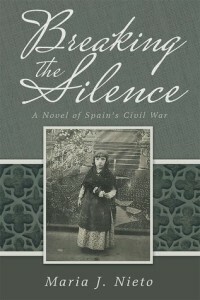 It is a book describing the pain and the horrifying days of a small girl’s life during and after the Spanish Civil War. There are moments of humor in the book, but mostly it deals the devastating effects that war creates for children. The book goes a little further into Spain’s post-war years under the yoke of a fascist dictatorship using ruthless mind altering techniques on children in order to assure their total loyalty to the new order. Mari, the child in the book, ends with the terrible decision she must make to atone for an act of treason she innocently committed. I was born in New York City in the middle of the Great Depression. Just a year later, the laws that rule the universes (I do not believe in coincidences), transported me to Madrid, Spain. Two years later, the same universal laws took my mother away from me. I do not remember the days after she disappeared, but I do remember that even though I forgot how to speak English, at stressful times strange sounds would almost sing inside of my mind. Sounds like “mommy”, “daddy”, “Teddy the bear”, and sometimes I could hear the soft voice of a woman whispering something that sounded like, ”you are my princess”. Nothing more. Three years passed and I suddenly found myself in the middle of falling bombs, crashing buildings and the passing of marching tanks in the night making cracking noises on the cobble-stoned street as they passed by the house. Some years passed and during my early teens, I was found reading a Reader’s Digest (in Spanish). That type of reading was forbidden. Nothing foreign was to be read in Spain, and no listening to radio stations from other countries was allowed. Because I was an American Citizen, I did not go to jail. Instead, my father was ordered to have me out of the country within three days. An uncle in New York who had converted into Judaism arranged for a Jewish organization helping children out of Nazi Germany, to look over me in Portugal as I waited for a ship to take me to the United States. Franco died and Spain’s new monarchy passed a law of silence, “a pact of silence”, as it was called. The people of Spain were not to talk or act on any issues that incurred during the war or during the dictatorship after the war. Franco’s murderers never went to trial for their crimes and continued to flourish and continued to use their money to hold on to power. After that, when I visited Spain, neither my family nor my friends would talk or mention the terrible years. During a visit to my grandmother’s village, I came upon a group of older women in the town’s plaza seated in a circle noisily and happily talking as they did their sewing. I introduced myself and told them that my grandmother was born in the village. They recognized her name, but when I told them that I had lived in the village for a short time during the war, the women looked at me, and one of them clipping her words almost yelled, “Ah, that was a long time ago.” All the other women went back to their sewing in silence. Finally, it became clear to me what was happening: I was choking on Spain’s silence denying me of my childhood, as well as my childhood friends being recognized and remembered. That is why, very slowly and in silence, I began to write Breaking the Silence and no one, friends or family knew about the book until it was published. My family in Spain received it well, and now the rumblings and the weight in my chest are gone, and I can again sleep through the nights. I started another book. Maybe I can finish it before the laws of the universe take me away from this planet and I begin to use my experiences on earth elsewhere. Maria was born in New York City but grew up in Spain from a very early age until her teen years. She returned to the United States and lived with her grandparents until graduating from Theodore High School in the Bronx. By that time she had fairly good command of English and after a short time roaming the streets of Greenwich Village and beating drums in Washington Square with a group of pacifists (then called Beatnicks), Maria decided that she wanted to go to school. Without financial resources, she joined the UN Navy and for a period of four years worked in psychiatric units and toured in a hospital ship from and to Korea to pick up the wounded. After her discharge from the Navy, Maria decided to go to nursing school so that she may be able to earn money after graduation as well as receive partial tuition from whatever hospital she happened to be working. Graduate from nursing, Maria went on for a BA in Education and began teaching Psychiatric Nursing and going to school at night. It took nearly twenty years of night school to obtain graduate and post graduate degrees from Temple University in Philadelphia. Maria moved to New Mexico and worked for the Indian Health Service rendering help to persons with emotional conflicts in the Navajo and Pueblo Indian Reservations. After a few years, Maria moved to Albuquerque and worked for the University of New Mexico Emergency Psychiatric Services, and then she retired. Retirement days were constantly interrupted by childhood issues apparently never resolved, so she wrote a book, Breaking the Silence. 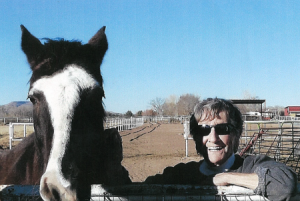 Maria is still retired and still living in New Mexico, and finally at peace after the book was published. She hopes that the book will be read: humanity needs to stop hurting each other.